Talking to a Christian about the character of God is always tiresome. What troubles me the most is how quickly so many dismiss anything in the Old Testament as being irrelevant. It is as if they think "that was God before he went through rehab, but now he's really a nice guy." To me, this is like watching a video of Hitler playing with a puppy and thinking, "Aw, how sweet!" If one was to do a profile of this god, what sort of person would we be looking at? The Old Testament god is just too easy a target. So let's see what this new and improved god of the New Testament is like. Let's begin with the Book of the Acts of the Apostles. In chapter five we find an account that never fails to astonish me. The sermon: "Jesus died for your sins. Repent therefore!" In the midst of this "Repent therefore" sermon, Peter is working himself into frenzy. His message is about the love of god and the horrible things that Jesus suffered through so as to reconcile man to god. He sees Ananias walk in and remembers looking over the offering ledger that morning. 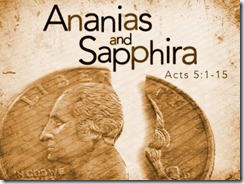 Ananias and his wife sold their house for 45,000 sheckles and gave it to the church. But Asaph, their realtor who was also on the board of deacons, clicked his tongue. "Well, they sold the place for 47,000 sheckles," Asaph reports. Peter is pissed. He sees Ananias walk into the congregation, stops in mid-sermon and asks, "Ananias, did you sell your property for 45,000 sheckles?" "Liar! Liar liar liar! Death!" and Ananias drops dead at the hand of god. Repeat for his wife, who also drops dead at the hand of god. Uh huh. OK. So, Jesus died for their sins but somehow God decided that lying about one's finances is now a capital crime? Let's contrast this against the god of the Old Testament for a moment. A guy named David who god really liked. This man committed adultery, killed the husband and married the woman. So God sent a prophet to tell the man that god was going to kill his innocent infant for David's crimes. Commit adultery and murder, an innocent dies. Lie about money, you die. Dare we inquire further into the character traits of this Old Testament god; multiple genocides, multiple infanticides, sending people off into slavery for not paying him any attention, and on and on? Surely there must be some good qualities about this character? After all, he did create the Garden of Eden. But then he set a trap for the people who had no idea what they were doing. Then he condemned all of future humanity with a sin-birth-defect as a result of these two committing a what? Mistake? Not a crime, surely. Hold on a sec. One of my reasonable Christian friends just reminded me that the whole fall of man thing is just an allegory to try to explain that people are basically sinful… Wait, say what? God starts out by telling humans that they are basically defective? That's messed up. But even the attempt to makeover his image, with Jesus as he marketing director, is fraught with some pretty awful revelations. As Jesus is delivering his most famous sermon about how blessed the meek and the peacemakers are, he throws in an entirely new concept: eternal damnation. Excuse me? The OT god would just kill people and that was that. Now he's tormenting them forever? That's f---ed up. And if we look a little closer at this same sermon, we find that it's not just what you do but what you think that will get you heaved into this pit of eternal fire? Thought crimes?! Really? As a final, desperate attempt to make it all OK, we are told that this god person became a virgin human sacrifice so that he could appease himself for the sins committed by the people who he created with the sin-birth-defect. As a consequence, these scum heads can live with him in eternal bliss. Dude, that is so whack. I think we can safely say that this god person is criminally insane. Now, honestly, this is the god Christians want us to believe in? I'm sorry but I simply don't have enough evil in me to ascribe this level of evil to a deity, any deity. Never mind that they want us to believe that this person is "good"" or "love itself." He hasn't even risen to the level of "sane" or "decent person." Isn't it far better to believe in no deity than to believe in one who is by word and deed the very antithesis of all that we hold to be morally sound? Thank goodness there are so many Christian apologists out there. The Christian god has a lot to apologize for. *I would love to take credit for this but I can't. I don't remember where I saw this summation but it has stuck with me and I thought I'd share.